Are We Experiencing a New Normal And Can It Have Implications With Smelt If The Donlin Mine Proceeds? - The Delta Discovery, Inc.
HomeVillage TelegraphAre We Experiencing a New Normal And Can It Have Implications With Smelt If The Donlin Mine Proceeds? Are We Experiencing a New Normal And Can It Have Implications With Smelt If The Donlin Mine Proceeds? May 23, 2017 Village Telegraph Comments Off on Are We Experiencing a New Normal And Can It Have Implications With Smelt If The Donlin Mine Proceeds? As a biologist living in either Bethel or Aniak for the past nineteen years, I’ve come to know the habits and behaviors of many of the Kuskokwim’s fishes. I not only studied them as a biologist – I fished for them as a subsistence user. I’ve worked for the U.S. Fish & Wildlife Service, The Kuskokwim Native Association, the Native Village of Napaimute and the Kuskokwim River Watershed Council; I’m also a member of the Kuskokwim River Salmon Management Working Group. During those years, I’ve also attended more mining-related meetings than I can count hosted by the folks from Donlin Gold, not to mention the occasional Army Corps of Engineers hosted-meetings. I doubt that you could visit any village for hundreds of miles, including on the Yukon, where you won’t see somebody wearing a Donlin hat or jacket; they’ve done a fabulous job of promoting the benefits of the mine or congratulating themselves for being a great neighbor. That may be true, but it may not; for projects as immense as this, decisions are usually based on the economics of a given situation or logistical feasibility. As companies refine their plans, the change is usually is in their best interest not necessarily ours. 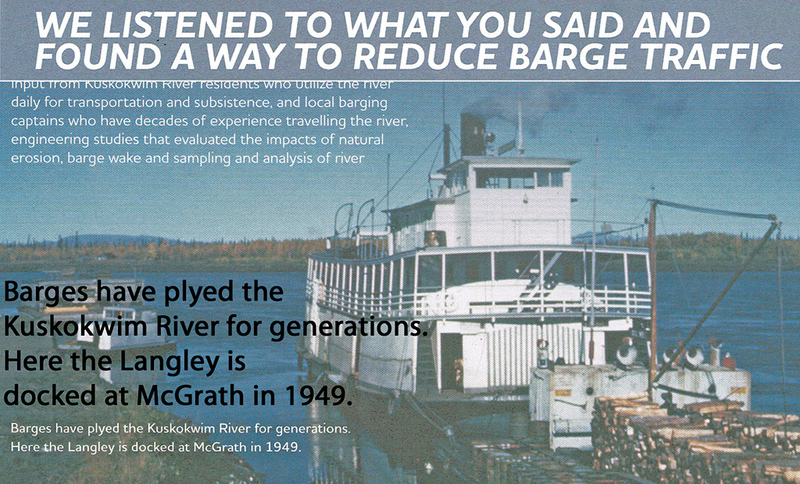 Then there was a picture of the old stern-wheeler Langley docked at McGrath in 1949, with the caption; “Barges have plyed the Kuskokwim River for generations.” Although a true statement, it’s very misleading. The Langley sternwheeler’s engine was rated at about 700 h.p., while the Donlin tugs will have a rating of 2,000 h.p. in order to push the four barge tows upriver (the combined barge length will be over 300 feet long). The traffic and facilities to accommodate the barges that would result as a consequence of “one of the worlds largest gold mines” would be unprecedented on this river. 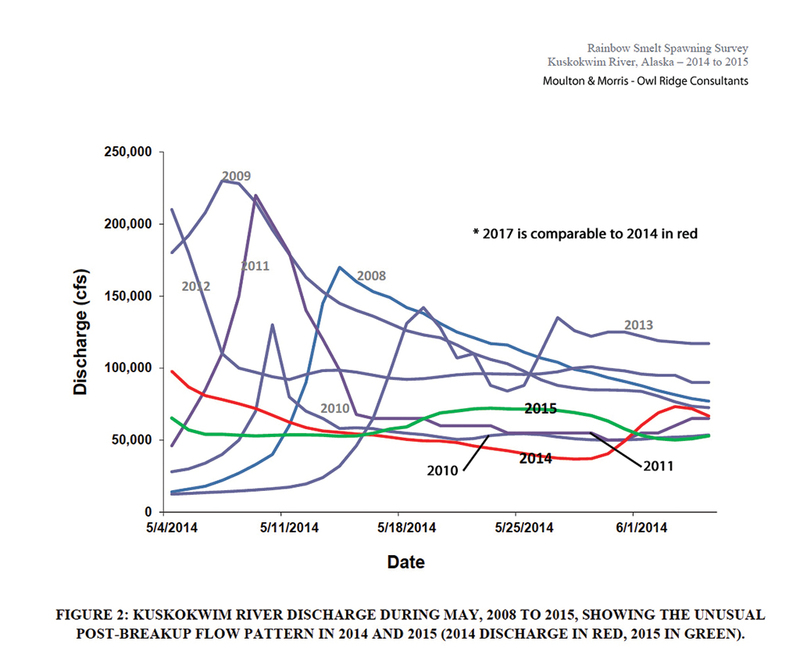 Put that immense horsepower on the river, coupled with the unusual runoff that is occurring right now – extremely low and clear for this time of year – and there would likely be impacts to the developing smelt eggs (right now they’re on their way to Kalskag to spawn). Never in all my attendances at those mining meetings have I ever heard a Donlin Gold employee volunteer any information that might hint of a potential problem on one of our subsistence resources. It’s only after someone brings up a possible concern like I’m about to do that they dance around and downplay the issue; AND THAT ALARMS ME! But you don’t have to take my word for it, here’s Table 3.13-30 of the Draft Environmental Impact Statement (DEIS)(top photo). This excerpt is also taken from Section 3.13 of the DEIS: During the 2015 rainbow smelt spawning survey, spawning occurred as shallow as 8.7 feet along a relatively confined channel segment. In such locations, a medium to high level of injury or mortality to incubating eggs could have resulted from the propeller scour of passing tug traffic, depending on the tug’s horsepower rating and engine speed. Because the narrow width and relatively shallow depth across this particular channel segment, it is unlikely that impacts to incubating rainbow smelt eggs could have been avoided by altering the line of travel of barge traffic (emphasis added). This year’s water is even much lower than what we experienced in 2015. The star-shaped symbols (middle graphic at left) denote the median or “middle” value of all the readings for that date since record keeping began (the median is similar, but a little different, than the average). 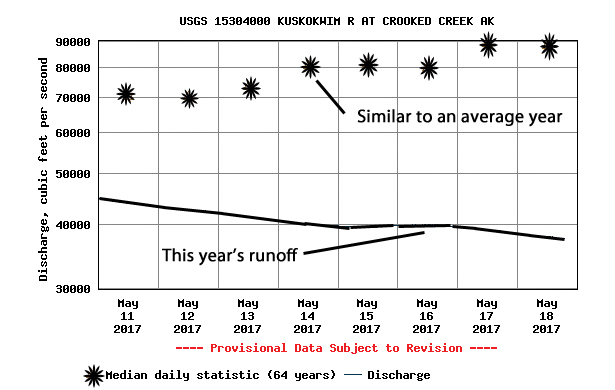 The solid black line shows how much water has been – and is – flowing past the village of Crooked Creek; that’s called river discharge and is measured in cubic feet per second. If you’ve been paying close attention to the river, the edge of water is a lot lower compared to where it usually is at this time. This picture (on page 1) shows just how low the water is in Aniak – the Aniak Slough is getting pinched off already. If you look at this year’s conditions along with 2010, 2011, 2014, & 2015 in the bottom graph (at left) , you’ll see that we may be approaching what biologists refer to as the “new normal”. There is a trend going on, at least in the short term. If it were to continue, then there would be many years in the 27-year life of the mine that would put developing smelt eggs in jeopardy. The lower the water level the greater the likelihood that prop wash will impact the developing smelt eggs. Looking at a typical year, if the Donlin Mine were to proceed the barges would begin negotiating the river as soon as the ice leaves Bethel. There has only been a limited two-year study on smelt and there is no population estimate to even detect if an impact was occurring; and the actual spawning locations above and below the villages of Kalskag have only been mapped those two years. That’s woefully inadequate to understand the basic biology of such a significant subsistence and ecologically important species. 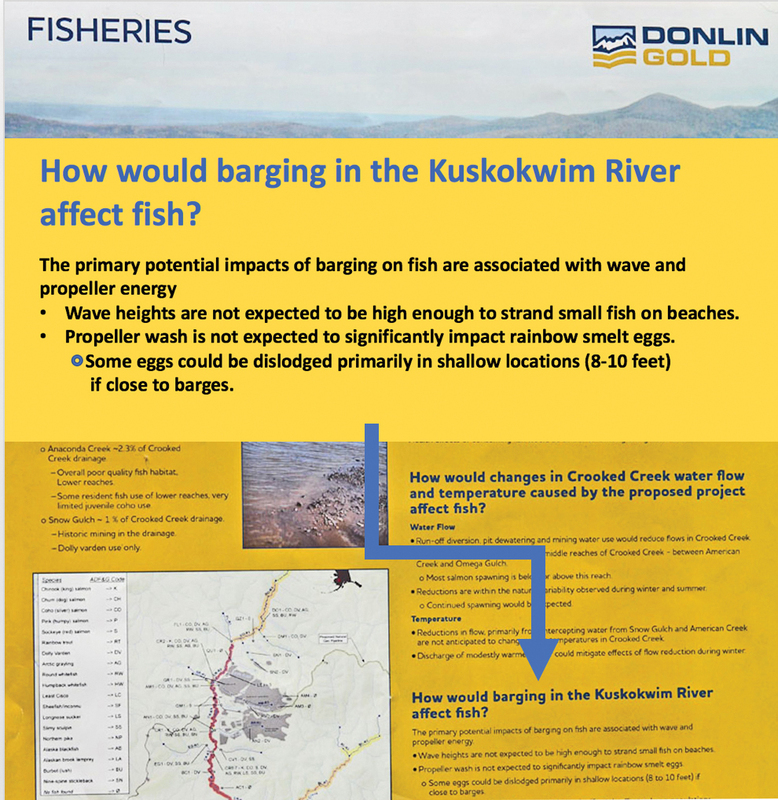 Yet here’s Donlin’s opinion on the impact to smelt – that they see as negligible (this is taken from one of their actual posters)(Poster at bottom to the right). As you’re out fishing for smelt this week, keep in mind that you have to look beyond the hype and propaganda to understand what the trade-offs will be. 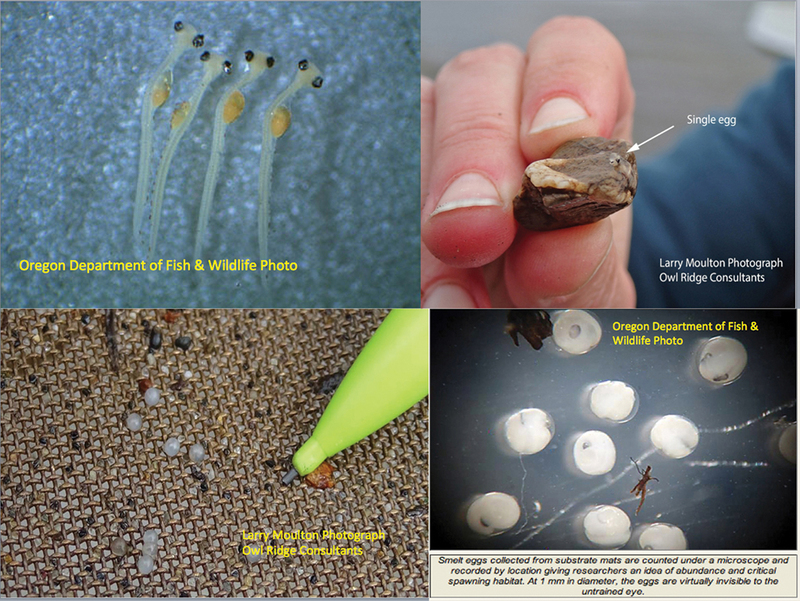 These photos show just how fragile the eggs and developing juveniles are (see below). I, for one, don’t think the tradeoff with the smelt is worth it. A picture of the old sternwheeler “Langley”.